You could hear the protestors from far away. A rhythmic chant in Japanese, probably a peace slogan. No more war or give peace a chance or something. I walked closer to the rally, wanting to see what was happening. I had seen them walk by as I checked into my hotel, a large group of people with posters, some of them in English. 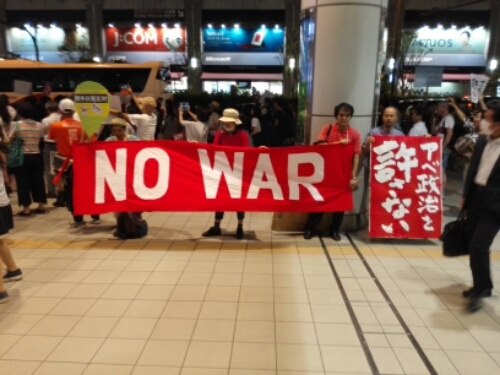 No more war. PEACE. Yes to Article Nine. They were chanting then as well. Funny how a provision in a constitution forced upon them by the US could evoke such passion, such feeling. I reached the protest, some lanes on the road was closed off for traffic, a podium had been made on the there. 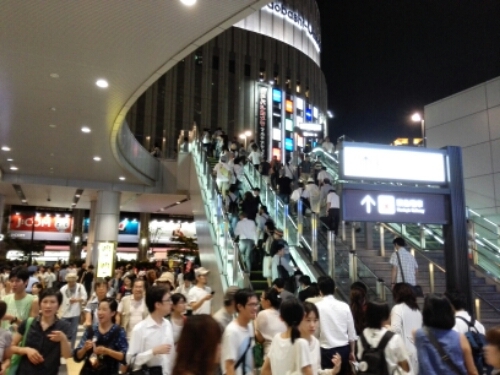 The people stood on the side walk and the elevated walkway above. Traffic passing between the podium and the crowd. Several people were standing on the podium. A woman was yelling into a megaphone, the people repeating what she said. A lot of people had showed up. After Japan’s defeat in World War Two, the country found itself occupied by US forces. Determined to never let something like the war happen again, the Americans wanted to change Japan into a democracy and root out the militarianism that had led to the world war. In drafting a new Japanese constitution a special clause, Article 9, was put in, where Japan relinquishes the right to use war as a means of resolving international disputes as well as keep forces with war potential. Only military forces to defend itself is allowed to be had. Article 9 has become something to be proud of by many Japanese. Japan stands out as a country of peace, leaving behind the horrible experiences of the first half of the century. There are some problems with the article though. Under the current security agreement with the US, American forces has to come to the aid of Japan if the country is attacked, Japan is not allowed to come to the aid of the US if it is attacked. This creates unbalance and tension. Another problematic issue is that Japanese forces cannot participate in international operations, such as against Daesh. The current government in Japan, led by Shinto Abe of the Liberal Democratic Party, has sought to change Article 9 to allow Japan greater freedom with their military (Self-defence forces). 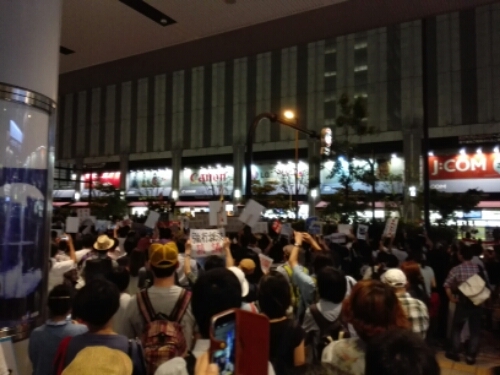 It was this constitutional change people had come to protest, a change the majority of the Japanese is against. Rallies in Japan are obviously well-arranged events. There were clear spaces for the protestors to stand, with ample room for pedestrians not involved to pass through. In the most crowded area, just in front of the podium, security guards with ropes were separating protestors from pedestrians. It was quite easy to move through the crowd. I watched the people on the podium for a while, decided to see if I could get a better view from the elevated walkway above me. I went up. The view was much better. Great view of the podium, and I could look down on the protesters. It has for a long time been the goal of prime minister Shinzo Abe to revise the constitution to allow Japan to participate in “collective self-defence”, i.e. coming to the aid of an ally under attack. After failing to get the support for a constitutional change in the summer of 2014, Abe and his party, the Liberal Democratic Party, changed strategy and instead tried to pass legislation reinterpreting the constitution. Under the new interpretation Japan can come to the aid of an ally under attack if the conflict could put “Japan’s survival” at risk. Having promised President Obama that the new legislation would pass in August 2015, it took until the middle of September to get it passed, even with a majority in the Diet. The opposition had to resort to trying to block members of the ruling bloc to enter the Diet in the end. It did not work, the new legislation received enough votes. I watched the rally until it ended, walking back and forth for a while, seeing it from several angles. A surprising number of sign held by the protesters were in English. The Japanese were trying to get international attention to their cause. Article nine was nominated for Nobel’s Peace Prize once, but the Nobel committee in Norway found that the article did not meet the proper criteria and could not be awarded the Peace Price. It will be interesting to see what the changes brings in the future. Prime Minister Abe is very clear that the legislation will not allow Japan to participate in the war on terrorism, but only to act when Japan itself is at risk. Many conditions must be met before the military can be employed. It seems he was more concerned with China than Daesh when drafting the legislation. Many people fear the US will quickly become disappointed by how little the Japanese military can still do, something which could lead to friction with an important ally. As the rally ended, the people dispersed quickly and quietly. No more chanting, no more shouting. The rally was over, time to go home. A few protestors hung around for a few minutes, holding their sign, but they eventually disappeared too. I took a walk around the area, this was my first time in Osaka. After a while I found a beer garden where I bought a beer and something to eat. This entry was posted in Japan and tagged Artivle 9, Osaka, politics, Shinto Abe, world war two on October 1, 2015 by Traveltorgeir. That’s a rather interesting account to about how a rally happens in a foreign country. Good to know that lives of general public doesn’t get affected even when a rally is happening! 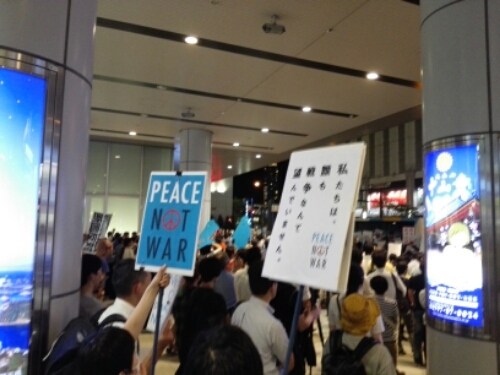 That is an interesting post, I never read about peace rallies in Japan. This gives an new insight into a culture I hardly know. How long did you stay? I guess the US were afraid of another militaristic japan when drafting their constitution. I like the idea of a pacifistic though. Too bad the article is under attack and seems to be removed from the constitution in the near future. I knew the history of world war 2 but not of Article 9 in Japan. We do live in a different world now to 1945 so i think that updating article 9 is the right thing to do. 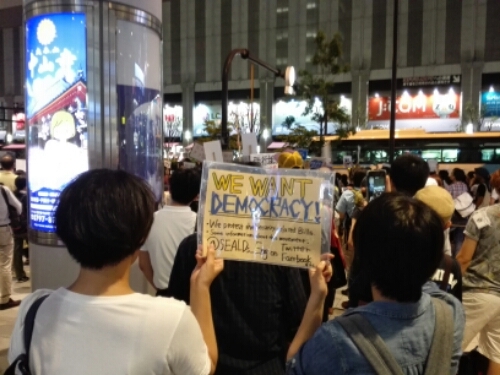 It’s interesting to see the protests and how strongly the Japanese feel about it. I did not know that a peace rally can be possible! Great job, Japan! Japan is like the friend that you want to have when you are so stressed out but desperately want to be calm. Haha! I have only read a bit about Article 9 of the Japanese Constitution. I like that they want to help their allies if they are in trouble. I really need to do a bit of further reading into the history of Japan, specifically with reference to the United States. It’s not generally covered in compulsory education over here so I’m kind of clueless! 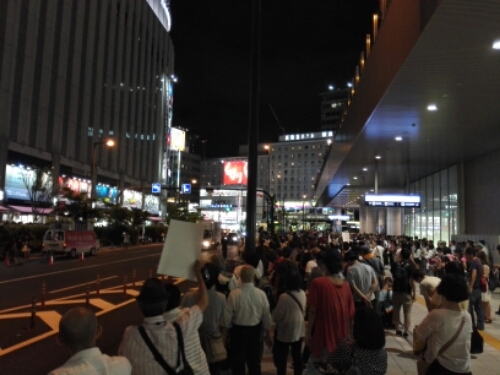 Of all the places in the world, I’d bet Japan would be the most organised with its protests. Interesting that some of the signs were in English but so clever! I love your perspective about this event. Peace rallies are definitely the most powerful kind. It goes to show that you can get your message across without resorting to violence. Unique read and interesting insightful information about peace rally in Osaka. Hope it was a successful event. So good to see that its a peace rally…and that it was peaceful. 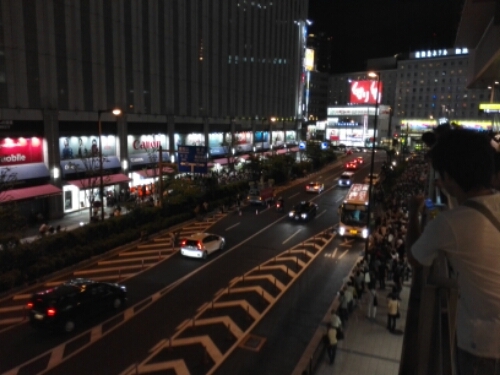 Honestly, I would never expect to see a rally in Japan..my imagination makes it seem so so peaceful and quiet. Thanks for sharing this account.